With slight tweaks to show they’re ‘of this season’. I talked about the shirt, dress, skirt, pants in a previous post. Here’s the jacket and accessories, plus some comments on a wardrobe. And some variations on the classics approach. There’s also a photo of a black one. I’ve made many comments on blazers already. and on patterns for last winter’s workwear. Notches, this season’s gimmick ? ‘This season’ tweak : the turned in notch collar. This version of a notched neckline first appeared on runways a couple of seasons ago. Originally made in a similar way to a blazer but with the collar turned in. McCall’s 6206 has this collar, though not at all a blazer shape. Happily there is an easy way of getting the notch. A neckline band with a break in it, shown clearly on the white shirt with black band. The In Style clothes are all black white and tan, with one red jacket. All the colour is in the accessories – the clear colours of this season’s colour blocking. And accessories are the easiest way of looking trendy/ current when you’re wearing classics. 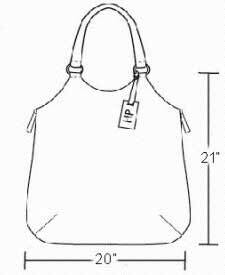 Perhaps Hot Patterns HP1023 Handbag Heaven Metropolitan Homage Tote. Complete your outfit with wedge heel shoes with thick soles. If those aren’t your style, wear ballet flats, kitten heels, or knee high boots with open toe and heel. Blue, green, red, purple. Orange and yellow are also strong colours of the season. 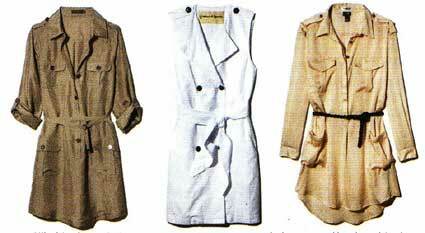 With one each of the original In Style items (shirt, shirtdress, jacket, pants) that just makes 4 possible outfits. If you made a shirt and matching skirt, instead of the shirtdress, you’d have 2 tops, 2 bottoms and a jacket. 5 items and 8 possible outfits. 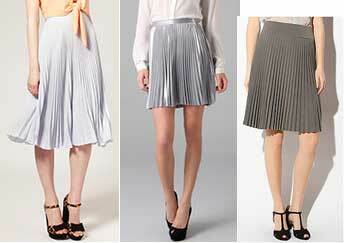 Add a blouse/ top and the pleated skirt into the mix, and you get 18 outfits from 7 items. Nearly a month of work days. 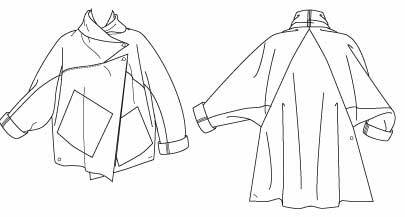 Add another jacket (cascade, revers, or asymmetric). Makes 27 different outfits if all 8 items co-ordinate. These blacks and whites don’t match up properly, but hopefully this gives the general idea. Use either blue whites or cream whites. And choose between black and navy. If you don’t look good in black, white and tan ? Choose your own favourite neutrals. Many people, me included, don’t look good in dark colours. Many don’t look good in white. So think of darker and lighter of one neutral. And add a different neutral in between. Cheer yourself up with colourful accessories ! It’s especially important to wear colours that make your skin tone look good, if you want to look effective. ‘Washed out’ is not a powerful look ! So this group makes a fairly obvious wardrobe. 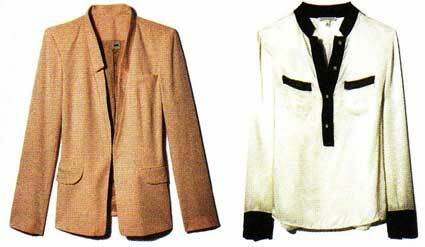 But if you’d like other wardrobe planning suggestions for work, here are a couple. Perfectly Packed has a ready-made working travel wardrobe of 8 pieces. Includes casual and more dressy items. Look at the interesting choice of fabric and colour to vary the styles. Add colour or go from work to evening by changing jewellery/ scarves/ shoes. She suggests adding a casual shirt, jeans, and a light sweater to cover even more possible occasions, all in one carry-on case. You could make this combination yourself by adding a shirt to many wardrobe patterns – check the shirt collar goes with the jacket neckline/ collar. 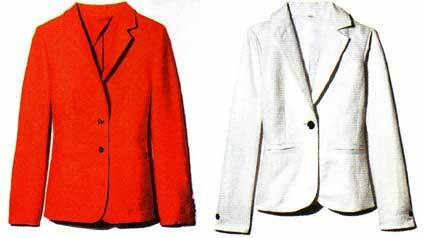 Easy if you use classic jackets such as blazer/ cardigan/ revers styles. 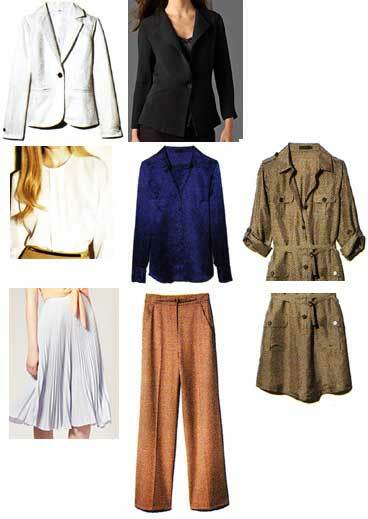 For Business Casual ideas there are several capsule suggestions from Imogen Lamport. Tailored jackets and formal shirts are replaced by more drapey styles in her Relaxed Business capsule, and by knits in her Business Casual capsule. and skirt, dress, pants, shirt. How could you soften (or sharpen !) these, if pure classics are not your style ? Most of the shapes are fairly relaxed for a casual look. Use tighter fit or more extreme shapes and sharp angles to look more edgey. Add softer trim, rounded corners, jewellery, scarves, for a prettier effect. Many ways to hint at your own rather different style. For some other seasonal ideas, look at In Style magazine site’s more general suggestions for this spring-summer. Or You Look Fab’s Must Haves for the season. When you have your basic blocks or TNTs, you can make easy changes. 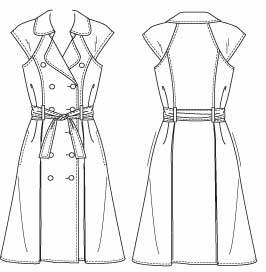 Add decorative seam lines, alter length, ease, openings, collars, sleeves, pockets, to make an almost infinite variety of styles. This suits me personally, as I like to wear simple classic shapes. But it does lead to the current uniformity in the shapes we wear. It doesn’t warm my heart by reminding me that fashion design can be an art form. For that I need to look at designs by people who explore new cuts and shapes. Perhaps the designs in the drapey angles post. Or Lynn Mizono’s Vogue 1216 jacket. Or patterns from Au Bonheur des Petites Mains, such as this Tunique drapée. And how about this pattern from La Mia Boutique magazine May issue. There are pleats in upper skirt, lower bodice, end of waist wraps. Those triangles pointing down are the front upper bodice ! Shapes which might never occur to someone starting from a flat pattern. If you want to try this yourself, get some cheap fabric and a dress form. Play around with scissors and pins. 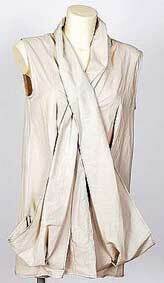 Madeleine Vionnet worked out her draped designs on a small dress form. image from the Vionnet site. Looks much more freeing than starting from flat pattern making. Sadly the only small dress forms I’ve found here in the UK are rather expensive. And I guess that making a usable pattern from what you’ve draped has to be quite a rigorous and precise process. There are several text books on draping, but I haven’t seen any of them. 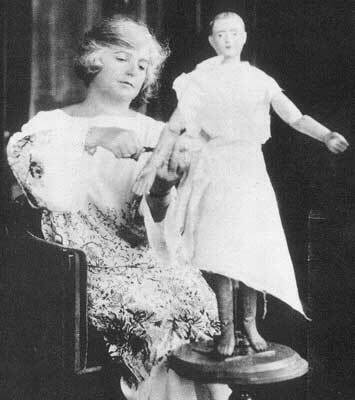 One is Connie Crawford The Art of Fashion Draping. (P.S. New book : a href=”http://www.amazon.com/Draping-Complete-Course-Karolyn-Kiisel/dp/1780672861/”>Draping – the complete course by Karolyn Kiisel. Some people find they’re naturally suited to flat pattern making. Others feel they’ve found their home when they start draping. Which are you happiest doing ? I’ve already described (here) the textbook approach to pattern making : draft the pattern for a closely fitting shell, then use that as the basis for pattern alterations. This post is about ways of getting a good-fit starting point. 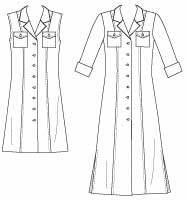 The ‘official’ method is to take your measurements, then draft a pattern from scratch on a blank piece of paper. But the aim is to get a well fitting basic. And there are much easier ways of achieving that. – use simpler methods for measuring and drafting. – take the measurements and let someone else do the drafting. – get a fitting shell without drafting, and no more measurements than you normally take when choosing a pattern size. ‘fitting shell’ : a basic closely fitting pattern. The same shape as the person it’s for, with little movement ease and no design features. Not usable directly as a garment pattern. ‘block’ : basic starting pattern for a type of garment, with the usual ease and style elements. 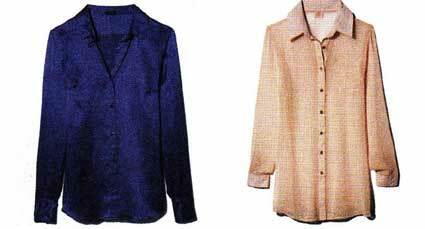 Such as a basic fitted blouse or casual jacket. All these simplifications make some assumptions. Some of these methods make very simplified patterns. All of them include some wearing ease. So they make assumptions about the clothes you want to make. Many people, especially custom dressmakers, like to make a fitting shell which is a ‘second skin’. Enough ease to breathe, but no assumptions about how loose the garments made from it should be, how much stretch there will be in the fabric used, or how easy it should be to make various movements. If you want a ‘second skin’ you will have to use a drafting method with no allowance for ease. Or do draping. Not one of these easier methods. As amateurs and hobbyists, we only have to fit ourselves and our families, and please ourselves with the methods we use and the clothes we make. So we can do things in a much easier way than professional designers and dressmakers, if we want to ! Much easier and cheaper to manufacture. And much easier to make a basic pattern for. Simplest of all is ‘Sew What ! – Fleece’ by Jessop and Sekora. They use 7 measurements to draw their ‘body template’. Then they add extra width to front opening, shoulders and side seams, to make tops and jackets. Easy pull-on pants from 5 measures and a similar approach. Book leads you through a sequence of projects so you learn both simple pattern making and sewing. All in fleece, so no need to neaten edges and prevent fraying. For a less easy starting point, there’s Cal Patch’s Design-it-yourself Clothes. This simplifies block making and pattern altering. Few darts, so not for large cup sizes. Problem : the instructions are mainly in paragraphs of words. Not good for a visual person. Also the focus is on pattern making, it’s not for beginners to sewing. She uses 24 measurements in all. For a wide range of clothes : skirt, tee, shirt/ light jacket, dress, pants. Modern styles. I don’t know how well these methods work for larger sizes. The simple Casual Block doesn’t fit me well. I now have my own ‘casual block’ with personal neckline and shoulder slope, back shoulder darts, and personal armholes and sleeve cap – very different front and back (post on that here). Many people with a full front look better if they add a bust dart to the casual block. Now I can apply the simple style changes which people suggest for the casual block, to my own version of it. I’ve tried several physical methods for making a basic starting point from your own measurements. There are also a couple of interesting block drafting rulers which I haven’t tried. 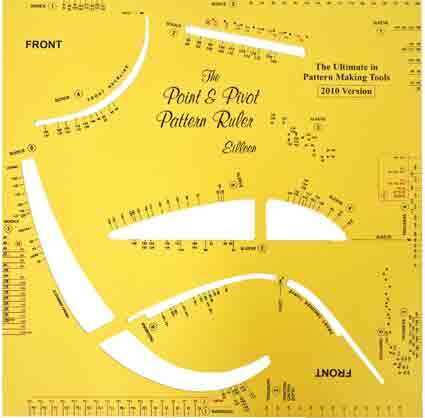 The Point and Pivot Pattern Ruler is from Eileen in South Africa. This covers personal measurements for bust, bust point and cup size, waist, hip, waist length, and could be adapted for shoulder length. 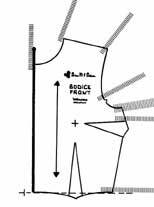 The video shows how to draft a bodice. The Sure-Fit system is a join-the-dots tracing method. She claims it can be used for any size body. The Sure-Fit dress kit allows for bust, cup size, bust point position, waist, waist length, high hip and hips, shoulder and arm length. These are all schemes for making basic blocks (simple usable patterns). Sure-Fit calls this your ‘body blueprint’. You then use standard pattern making methods to get other styles. I think the Sure-Fit booklets, more visual, are very good. And the instructions can be used to make new styles whatever your source of basic blocks. Sadly, none of these include all my challenges in getting neckline, shoulders, high round back, armhole, to fit. I need to do those fit alterations myself. For people with a longer back crotch measure, the Sure-Fit pants don’t discriminate between those who need more vertical length and more angle, to accommodate a large rear, compared to people who need more horizontal crotch extensions, to accommodate a deep torso (see my note on pants wedges). There are many helpful SFD videos about improving the fit at the SFD Learning Center. These apply to fitting any personal blocks, not just the Sure-Fit Designs derived ones. And you only have to make alterations once on the basic pattern. Then all patterns you make from your adjusted personal block ‘blueprint’ will include those changes ready made. With the re-issue of Sure-Fit there has been a lot of interest, see Stitchers Guild discussion thread. 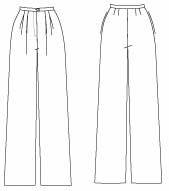 In the FitNice System you trace very simple basic shapes for knit casual-block top and elastic waist pants. 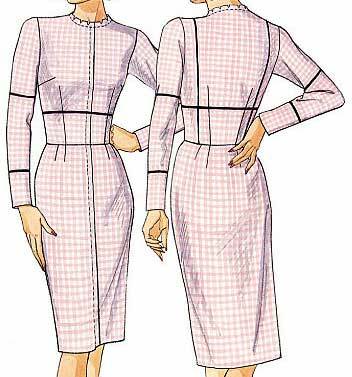 Many simple ideas for pattern alterations to make new styles. Up to finished measurement at bust level of 48-1/2 inches/ 123 cm. The conversion for wovens doesn’t work well for my body shape, as the simple unadjusted casual block isn’t good on me. I had a lot of problems with the discs on my elderly Mac, but she did give me a quick complete refund without me asking. What if you want a basic which allows for more of your personal measurements ? The idea of pattern making software is that you put in your measurements, and it produces the patterns for you. All the software brands use different measurements and different ways of calculating the patterns. 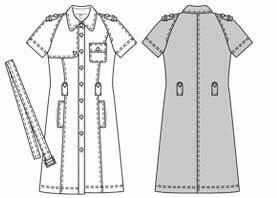 In Pattern Master Boutique you enter your measurements and test fit a set of basic fitting shell patterns : bodice, skirt, pants, and sheath dress. If the fit isn’t right, you enter slightly changed measurements, print out another pattern, try that, and so on. Once you’ve got the fitting shell right, then you can choose from a huge variety of style elements to make your designs. Bernina My Label doesn’t make the two stages (fitting and styling) clearly separate. You enter your measurements (many more than for PMB), and try out simple tunic and pants styles to refine the fit, by changing the measurements again. Then there’s a range of about 25 classic styles. You’re expected to use your own pattern making knowledge to adapt these to other styles. There’s a good range of guidance about doing this on the website. Many of their pdfs give advice about pattern making which you can use with any starting point, not just BML. Basically, the aim of BML is to produce a set of good classic blocks which you can alter to make other styles. The fun attraction of BML is the simulation of your body shape, with the clothes on it. So you can try out different lengths, levels of ease, etc. and get an idea of what’s most flattering. Those are the only pattern making software I have personal experience with. There are many other software companies (see list in my software post). I found this sort of fitting process is not one I enjoy at all. And I’m too far from average in too many ways for it to be very successful for me. It’s a good idea to start small and find if using pattern software is a way of working you enjoy. And best to start by expecting ‘better’ rather than ‘ideal’ for the fit. It may take several tries to get the best fit you can. It’s not an approach which works well for me. Wild Ginger (who produce Pattern Master Boutique) also sell Click & Sew software for fitting shells. Pattern.stringcodes.com is an on-line company that produces personal fitting shells. Unique Patterns provides personally fitted versions of some Simplicity and New Look designs. There are some interesting pdfs in their Education section. As with pattern making software, both these products are more successful if you send them good measurements ! Most ways of making a personal fitting shell use many measurements. And it’s difficult to take those accurately, especially on yourself. But there isn’t actually any need to do detailed measuring to get a fitting shell – if your size is within the usual pattern ranges. Well, no more than the measuring needed to choose a pattern size. Butterick 5627 for sizes 6 to 22. Butterick 5628 for sizes 16W to 32W. McCall’s 2718 (below) This has bodice fronts for 5 cup sizes. Individual patterns for sizes 6 to 22.
and Vogue 1004, individual patterns for sizes 6 to 22. (Sandra Betzina’s patterns are a different shape). These patterns include guidance about how to get them to fit well. 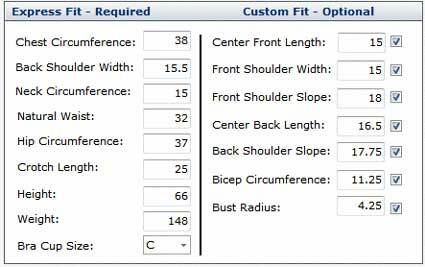 You may get a better fit for your shoulders if you choose the pattern size by high bust/ chest, rather than full bust measurement (see my post on the FBA). 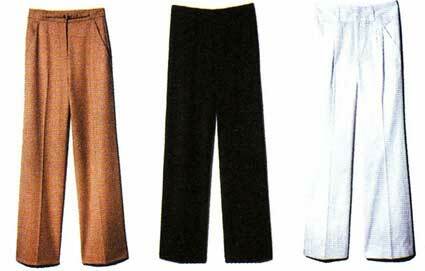 There’s also a pants fitting shell, Vogue 1003, individual patterns for sizes 6 to 22. Probably best for people who don’t protrude front or rear (see my post on pant fit). Starting from one of these commercial patterns gives you a double payoff. You get a fitting shell which you can use for your own pattern making. You also know how your body differs from the average Big 4 pattern. So you know what changes you need to make, and how big, every time you use one of their patterns. This would be my preferred method. Except they none of them say much about how to get a comfortable armhole and sleeve cap, which I really do want to do something about. And now I have a good fit pattern, it differs so much from the commercial shapes, I find it a huge hassle to do all the changes. Easier (I think at the moment !) to start from my own basic shapes and add the style elements from patterns I like. Using a commercial fitting shell pattern, you just need to use standard fitting techniques to get a good fit. But if you know about fitting techniques, you don’t need the extra instructions in the commercial fitting shells. You could use those fitting techniques on any simple pattern. Then you can use that well fitting pattern as a basis for simple style changes. Like TNT (tried ‘n true) patterns, but ones delibrately chosen to be good starting points for redesign. After trying a whole lot of other possibilites, that is what I find myself doing. At least with all my lengthy struggles to get software to fit, I did learn a lot about fitting myself ! 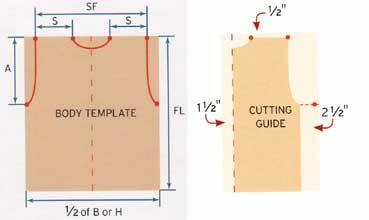 If you drape your fitting shell directly on your body, you only need measure enough to cut a fabric rectangle big enough to cover the area. And do the rest by draping. Connie Crawford has a DVD on this, called the Custom Bodice DVD. There’s an interesting sample clip at the site. There’s one review at Pattern Review from someone who managed to do it on herself. From comments added to this review, it sounds as if this method is good if different parts of you are different sizes. Or if the 2 sides of your body are different shapes. I haven’t tried draping myself. The price of this DVD is above the customs limit here in the UK, so expensive. There is a similar sounding DVD available here, The Art of Dress Modelling by Lisa Silberberg from Shoben Fashion Media. But that’s all I know about it. 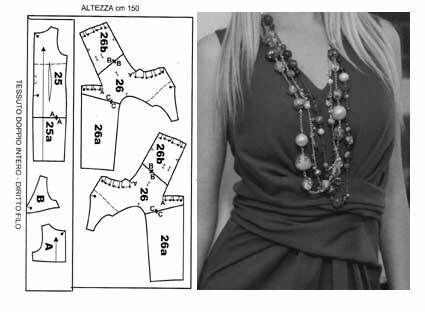 There are written instructions and photos about draping a fitting shell in ‘Patternmaking for Fashion Designers’ womenswear by Lori Knowles. Draping gives you a ‘second skin’ sort of fitting shell. You will need to add ease to most measurements to get a wearable pattern. P.S. See the comments for some more very good suggestions about getting a well fitting starting point for pattern making. So which do you enjoy – taking accurate measurements, doing the drafting, or fitting, or draping ? You need to decide whether you want to work towards a personal fitting shell which is a close fit ‘second skin’ with no movement ease. Or personal blocks, which can be used as patterns for simple garments. Or the TNT equivalent. But this was getting too long, so I’ve put all that in a separate post. There’s a wealth of methods for getting a well fitting starting point for making new styles. Obviously it’s something people have difficulty with. And have been inspired to think of solutions for. Developing a fitting shell or basic blocks may not be something we have to do often. But if we find the right method for us, it can be something we enjoy rather than keep putting off. These easy methods can be good for people who need few fit adjustments, but not for people who are far from average. None of the simplified methods do – and I spent years trying them ! Many don’t deal with different cup sizes. Let alone sloping/ square shoulders, round backs, etc. My post on Getting to know my sizes lists my differences !